I remember the day we got our first video player very clearly. Note I said video player, not recorder; we weren’t that flush. It was a Saisho and I think, but can’t be sure, that it was from Rumbelows and as a special offer it came with three free video tapes. The first was most appealing: a Thundercats compilation. The second held no interest whatsoever. It was a movie called Being There and was the last to star comedy legend Peter Sellers. To this day I’ve never seen it. As for the third freebie, well, that was the real unexpected gem. I knew who Dire Straits were from their hugely successful hits Money For Nothing and Walk Of Life but hadn’t taken to them precisely because of them. Making Movies was their third album and the promo videos for the album’s singles made up the last and most treasured of the tapes we got with the cut-price Japanese addition to our council estate Shangri-La. The stand out tracks were the achingly beautiful love song Romeo And Juliet and the epic Tunnel Of Love, with its fairground waltzer intro and adolescent recollections of Whitley Bay’s erstwhile amusement arcades at the town’s iconic Spanish City. The video for the latter was all-the-more memorable for the appearance of the impossibly flawless Leslie Ash in the role of Mark Knopfler’s muse. Why am I banging on about this you might ask? Well, the very first video we went and bought to go with our new household investment was an extended highlights package of Brazil’s 1970 World Cup campaign. For the life of me I can’t remember its name and can find no trace of it hidden in any long forgotten old box or cramped loft space at my parents’ house. Having scoured the internet, I first thought it was Boys From Brazil: The Official BBC History Of The Brazilian World Cup Team but its release date is a few years too late, and besides, that covers several World Cups narrated by the knowing voice of John Motson. Whatever its name, remembering that VHS tape whips up a dream-like fog over my mind that was once a romantic haze, for it was a pure and joyous thing to own. They – the Brazilian side of 1970 - were the fabled greatest team that ever lived. They redefined football and how it was supposed to be, yet only the Gods could dare plagiarise them, for other mortals were just inadequate. That video was almost biblical in a football sense. To watch it was to be present at the opening of the Ark of the Covenant. What got me thinking about this lost treasure was the recent 76th birthday of Pelé; the spiritual leader of them all; goal scorer extraordinaire; genius; arguably the game’s greatest player; a 20th century icon that transcended sport in the same way that few others did – Muhammad Ali, Ayrton Senna, Jesse Owens. Less happily, I learned of the sad passing of that team’s captain Carlos Alberto from a heart attack aged 72. It was he, of course, that scored the fourth and final Brazil goal in the 1970 World Cup final in Mexico City; a low-flying missile that concluded what for many is the finest goal ever scored, coming as it did at the end of a glorious team move that demonstrated how easy and how poetic the game can be. If Brazil’s World Cup triumph of 1970 is football’s ceiling of the Sistine Chapel, then Carlos Alberto’s goal is the Creation of Adam. When recalling that incredible Seleção, the names just trip off the tongue – Pelé, Jairzinho, Rivelino, Carlos Alberto, Gerson – all heroes in eternity. Yet, one man – in my opinion – rarely receives the praise he deserves for his part in their success. He was a short, slight, waspish figure; graceful and lithe with the unshakeable balance of a gymnast. He oozed the kind of creativity we see these days in the likes of Andres Iniesta. The native of Brazil’s sixth largest city Belo Horizonte began his professional career at just 15 in the early 1960s with América MG before a move to city rivals Cruzeiro soon after. While playing for Raposa his sheer volume of goals grabbed the attention of successive national team coaches from Vicente Feola to João Saldanha and finally the great Mário Zagallo. He was a regular pick for Brazil before his 20th birthday. What made his feats so impressive was that he was a player almost without position, except for that which he himself decided on. Neither midfielder nor forward, wherever a pass needed making, a run needed embarking upon, or a shot needed converting, Tostão was invariably involved. He was both elusive and obvious – a hide and seek champion in plain sight. The debacle of Brazil’s 1966 World Cup campaign in England - where the holders and favourites were not only kicked and barged all over Goodison Park (where they played their only three games of the tournament) - exposed them as over confident bordering on arrogant, complacent, and far beyond their peak of four years earlier in Chile. Returning home to widespread derision, the old guard was gradually dismantled in favour of a new vibrant side, one that would grow together and re-establish Brazil as the kings of international football at the 1970 World Cup held in Mexico. That would be easier said than done, though. England arrived at the tournament to defend their crown with a supposedly better squad than the one that won in 1966, even accounting for star man Bobby Charlton being the wrong side of 30 and supposedly on the wane. West Germany – with Franz Beckenbauer and Gerd Müller entering the prime of their careers – were a coming force, while the Italians were always strong contenders and had top class players from the ultra-competitive Serie A such as Luigi Riva, Sandro Mazzola and Giacinto Facchetti. However, at that point, no European side had ever captured the trophy outside its own continent, giving the reborn Brazilians a critical edge in what would be familiar conditions. By the time the competition began Tostão was still just 23 years old but had already won five consecutive Minas Gerais State Championships and a national title for Cruzeiro. He was on his way to scoring 249 goals in 378 appearances – a stunning return for someone not considered an out-and-out striker. He had become first choice in attack in the post-1966 rebuilding job (Tostão was in the squad and played one group game vs. Hungary) and was no longer considered by others – or himself – as Pelé’s understudy. Also crucial to Tostão’s elevation was Pelé’s decision to retire from international football after the overly aggressive treatment he had experienced in 1966, a decision he was persuaded to reconsider in 1969. That same year, Tostão’s football career was almost curtailed before he had the chance to go down in history as one of the game’s greats. In October – just eight months before the World Cup finals – a ball was hit with such force into his face that he suffered a detached retina; an injury that can, and does, cause severe visual impairment even after corrective surgery. Tostão’s vision was saved after two operations by a Miami-based ophthalmologist, Roberto Moura – himself Brazilian. 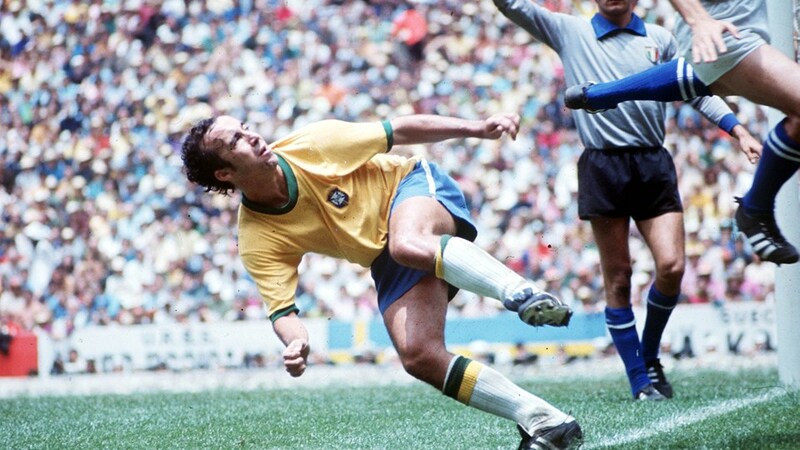 Having missed eight months of football before the tournament just as he had become as important to the new Brazil as anyone - including the restored Pelé - the fear was that Tostão would be well short of his best even though Zagallo had enough faith in him to be part of the World Cup squad. As if to emphasise the coach’s belief that his playmaker would be key to Brazil’s chances of winning the Jules Rimet trophy for a third time, meaning they could keep it forever, Tostão was handed the number 9 shirt and started their opening group game with Czechoslovakia. That the Brazilians ran out comfortable 4-1 winners does not tell the whole story. Despite their obvious brilliance they had their flaws and Czechoslovakia repeatedly preyed upon them, taking the lead in the game, and subsequently wasting several clear-cut chances to upset the favourites. It was a game made famous by a couple of moments of brilliance from Pelé; a beautifully taken goal laid on by a perfect Rivelino chipped pass, and an audacious effort from inside his own half that drifted inches wide with the goalkeeper gazing helplessly skywards. Tostão’s contribution in the role as Pelé’s foil was obvious. He created space for himself to operate in but did the same for his partner, drawing the defenders’ attentions from him in a way that had been missing throughout the brutality of 1966. Also evident was the beefed-up stature of the Brazilian players compared to previous tournaments. They were determined not to be physically dominated again and added more pace and power to their game to complement their natural flair. Rivelino, Gerson and Pelé looked imposing; Carlos Alberto was the supreme athlete, surging back and forth along the right flank creating a template for Brazilian full backs for generations to come; Jairzinho prowled the front line with all the grace and agility of a black panther. The exception was Tostão. He was weedy and sickly-looking by comparison, yet his advantage came from his head. Knowing when and where to be bought him time and room to use his skill to as much effect as a Rivelino thunderbolt or a lung-bursting run by Carlos Alberto. The second match on Brazil’s schedule was the most pivotal of all. It came in searing daytime heat at the Estadio Jalisco in Guadalajara against holders England and was seen as the final in all but name. And it didn’t disappoint. Players, managers, goals take on mythical status but rarely do entire matches. This one was different and had it all. Colour TV live coverage beamed around the world may have added gravity to the occasion but is Gordon Banks’ stop from Pelé’s towering far post header still not the benchmark by which all great saves are measured? Is Bobby Moore’s expertly executed last ditch tackle on a rampaging Jairzinho not also held up as the exemplar in the art of defending? The England captain called it the best international game he’d ever participated in; which, considering he appeared 108 times for his country and won a World Cup final indicates just how monumental an encounter it was. Tostão’s involvement was vital to the game’s decisive moment. He fended off Alan Ball on the left wing before nutmegging Moore, pirouetting inside the box and lifting a perfect pass to Pelé’s feet. He then squared it to Jairzinho who hammered the ball into the net to settle matters. Ominously, Brazil – and especially their front three – were beginning to click. The third and final group game was a lot closer on the score line than it should have been – a 3-2 win over Romania. Tostão once again linked with the world’s most famous player, deftly backheeling a corner from the right into the six-yard box for Pelé to tuck away Brazil’s winning goal. Zagallo’s men faced fellow South Americans Peru – managed by two-time World Cup winner and Brazilian legend Didi – in the quarter-finals. June 14th 1970, noon. Simultaneously, two classic games played out. Over in León, West Germany overturned a two-goal deficit and expelled the wilting English from a World Cup they were expected to at least reach the final of. As Bobby Charlton bowed out, Tostão took centre stage wreaking havoc in the channels between centre backs and full backs; first laying the ball off to Rivelino who drilled a trademarked drive past the keeper to give Brazil the lead. He then took advantage of slack concentration to ghost into the box from a short corner to squeeze a shot between keeper and post from an improbable angle to put Brazil firmly in the driving seat. Brazil’s weakest link – goalkeeper Felix – was beaten in an almost identical fashion soon after to give Peru a way back into the contest, only for Tostão to tap home his second after an assist from Pelé. The game eventually ended in a 4-2 win for Brazil, the left foot and subtlety of Tostão proving elemental in the victory. In the semi-final against Uruguay, Pelé was at it again; creating magic moments. And like the attempt on goal from his own half in the Czechoslovakia game, his genius went unrewarded as he threw the goalkeeper an outrageous dummy on the edge of the box before rounding him and directing his shot agonisingly wide. It’s these incidents that highlight just how special he was, but every Pelé needs his Tostão, just like every Messi needs his Iniesta. Tostão’s presence enabled Pelé to be Pelé, and the world should be eternally grateful for that. Uruguay took a surprise lead when Cubilla placed a timid shot past the leaden footed Felix. In first half injury time Tostão drifted to the left wing and received a pass from Clodoaldo. His return was curled exquisitely back into the path of Clodoaldo who sprung from deep and ran into the gaping hole Tostão had left in the Uruguayan defence with his intelligent movement. The defensive midfielder lashed a shot into the far corner of the net restoring parity and giving the Boys from Brazil the platform from which to show their class. Brazil got a head of steam up in the second half with the Pelé/Tostão axis dragging defenders to places they didn’t want to go. The inevitable happened thanks again to Tostão’s vision and ability to pick out the killer ball – this time to flying winger Jairzinho who latched onto another geometrically precise pass to use his scorching pace and slide home past the Uruguayan keeper. Jairzinho fell to his knees in celebration, the first man to congratulate him was the architect, Tostão. Despite some late nerves, Brazil completed the win with a Rivelino goal in the last minute, Tostão again pivotal in the breakaway. They had reached the final as the undoubted stand out team at the competition despite obvious weaknesses in defence and, of course, with the much-maligned Felix in goal. Finally leaving Guadalajara, where they’d played all their games to date throughout the World Cup, they switched to the giant cauldron of the Azteca Stadium in Mexico City to face the resolutely professional Italians in front of 107,000 fans, with most neutrals seemingly placing themselves firmly on the side of the entertaining Brazilians. Both sides traded early blows with ‘El Rey Pelé’, as the BBC’s Kenneth Wolstenholme proclaimed him, soaring high in the air to power home a far post header from a Rivelino cross. Tostão’s input; a quick throw in and even quicker thinking. The Italians hit back through Roberto Boninsegna after the type of defensive calamity that had plagued the Brazilians all the way through the tournament finally costing them dear. The Europeans continued to threaten but as the second half wore on, the strength sapping effects of the extra time epic against West Germany began to tell as legs noticeably tired. Tostão continued to buzz around with gaps becoming increasingly available. Tostão chased back into his own half to win the ball, still running and scheming despite the victory being seemingly in the bag. Short, snappy passes were exchanged in midfield before Clodoaldo danced and bodyswerved past four Italians. Rivelino took over, arrowing a pass down the line onto the boot of Jairzinho who then powered in field. He gave it to Pelé who stood patiently as if waiting for the rest of the world to catch up with him. If you look carefully at the footage, Tostão - who had somehow made his way rapidly and undetected to the edge of Italy’s box while that famous move was playing out – was pointing to the flash of bright yellow charging up the right flank. It was captain Carlos Alberto. Pelé claims he never got a call from his skipper to play the ball to him – the simplest, yet the most perfect pass in football history – but his strike partner’s instruction would certainly have nudged Pelé’s ‘instinct’. Carlos Alberto arrived like an express train and met the ball – which popped up neatly off the bobbly playing surface – with his right foot, exploding through the contact. Tostão, always alert to possibilities in the box, hammers the ball gleefully back into the net once the goal is scored and is the first to greet his elated team mate in his moment of glory. That fourth goal has gone down as arguably the most beautiful goal of all time and is certainly the most joyous and encapsulated everything that is synonymous with Brazilian football, even if the modern-day teams have struggled to live up to such unattainable standards. The team of 1970, of which Tostão was a fundamental, if sometimes undervalued component, was the culmination of a four-year cycle of development which restored the country’s aura of invincibility after the meek surrender of their crown in 1966. Soon after, the team slowly began to pick itself apart. Pelé, with nothing left to prove and money to be made, retired from the national team in 1971 aged just 31, and by the time the next World Cup came around in 1974, Brazil were a shadow of the team from just four years earlier. Tostão, too, failed to make the 1974 World Cup where he would still only have been 27 years old and at the peak of his powers. The vision problems caused by his detached retina injury in 1969 resurfaced just a year after his Brazilian record transfer from Cruzeiro to Vasco da Gama in 1972. His post-football life has been a combination of TV punditry and journalism work under his more recognised name and as a medical doctor under his own name, Eduardo Gonçalves de Andrade. He is still Cruzeiro’s leading goalscorer and is joint tenth on the list of all time scorers for the Seleção behind some of the most remarkable players ever to have laced up a pair of boots. Voted number 53 in World Soccer Magazine’s Greatest 50 Players of the 20th Century, Tostão’s legacy in the game is assured even though he lived somewhat in the shadows of his more flamboyant compatriots. But without him, it’s debatable whether they would have shined to the same extent as they did during those sun-drenched summer afternoons in Mexico.